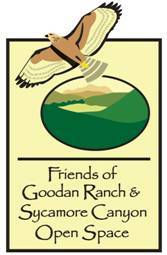 Sycamore Canyon Open Space Website! No vehicular traffic is permitted in the Preserve. Goodan staging area accessed from Poway Rd. east on Garden Rd, then south on Sycamore Canyon Rd. Sycamore Canyon Rd. ends at parking lot. The Parks website is sdparks.org. During and after rainy weather the Parks Preserves are closed for safety and damage control due to muddy, wet trails and roads. Please check the Parks website or call the ranger’s office at 858-513-4737 for Preserve status.